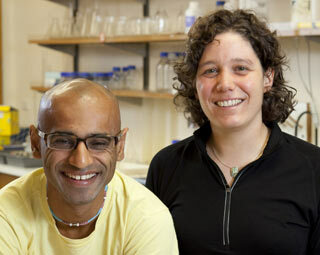 Dr Arvind Varsani and Dr Melanie Massaro (Biological Sciences) co-ordinated the study. Researchers at the University of Canterbury have found two threatened native parrot species are at risk from Beak and Feather Disease Virus (BFDV), which has been discovered in the South Island for the first time. The collaborative study on BFDV found the potentially fatal parrot disease in red-fronted parakeets on Little Barrier Island and wild birds of the invasive Australian Eastern rosella in Auckland, which both carried viral isolates from the same strain. The research also discovered the disease for the first time in the South Island where yellow-crowned parakeets in Fiordland were found to be infected with a completely different and novel virus strain of this disease. Dr Arvind Varsani and Dr Melanie Massaro (Biological Sciences) co-ordinated the study, which also involved Luis Ortiz-Catedral (Massey University), Josie Gailbraith (University of Auckland) Kate McInnes, and Ron Moorhouse (the Department of Conservation) and also staff from the Auckland Zoo. Dr Varsani says the study represents the first comprehensive attempt to systematically screen New Zealand’s endangered and threatened parrots for BFDV. “More than 780 birds of seven threatened and endangered New Zealand parrot species, including endangered kakapo and orange-fronted parakeet, and the introduced Australian Eastern rosella were tested for BFDV,” says Dr Varsani. "Given that circoviruses, such as the BFDV, evolve rapidly, they can easily move across hosts and thus spread among different species of parrots." Since it was first discovered in Australian parrots, the disease has spread throughout the world, largely due to legal and illegal pet trading, and affects both captive and wild parrots globally. "Analysing full viral genome sequences allows us to trace the history of movement of the virus and to understand disease transmission, which has implications for the management of this emerging, infectious disease in New Zealand," says Dr Massaro. This study highlights the need for continued, systematic BFDV screening in captive-breeding facilities as well as wild populations of parrots in New Zealand.